Over 160,000 km2 of windy land areas have been estimated to have good-to-excellent wind resource potential. 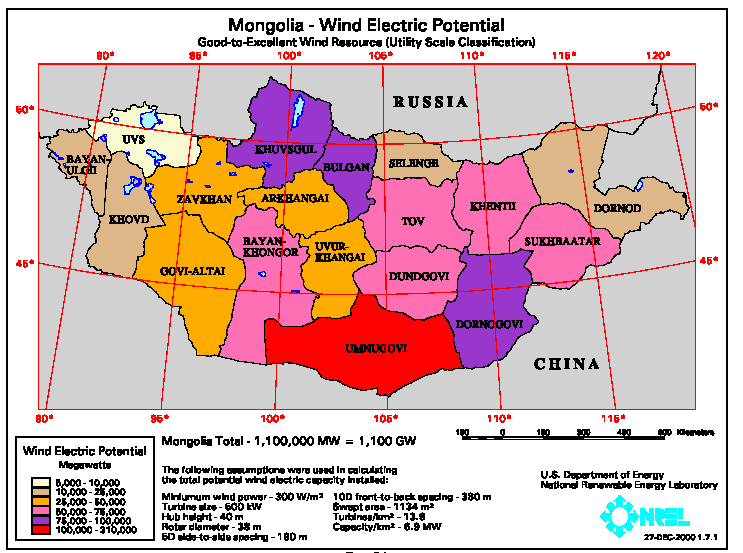 The amount of windy land is about 10% of the total land area (1,565,000 km2) of Mongolia. This amount of windy land, using conservative assumptions that result in about 7 MW of capacity per km2, could support over 1,100,000 MW of installed capacity, and potentially deliver over 2.5 trillion kWh per year. 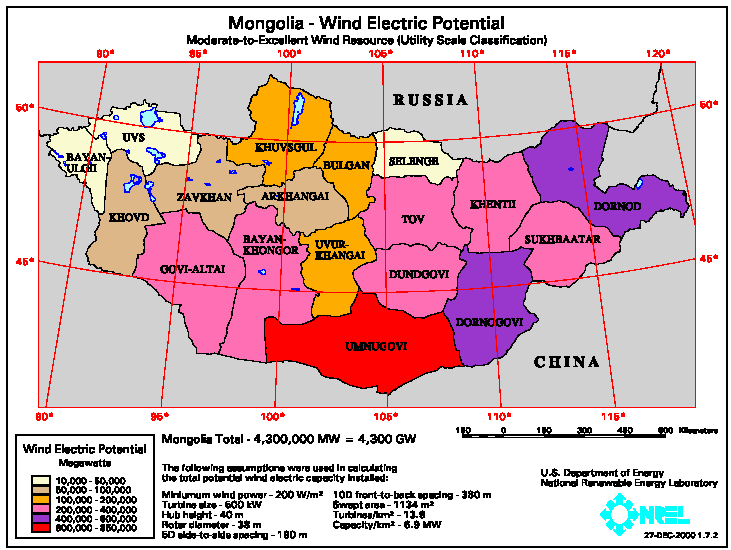 All of the aimags (regions) have at least 6,000 MW of wind potential. 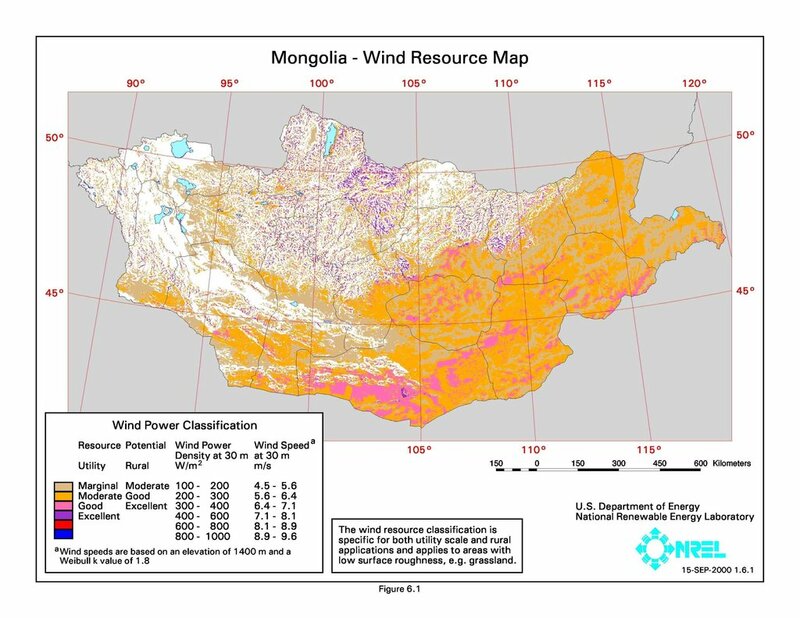 Thirteen aimags have at least 20,000 MW of wind potential with 9 aimags having greater than 50,000 MW of potential. Umnugovi aimag alone is estimated to have over 300,000 MW of potential. Additional studies are required to more accurately assess the wind electric potential, considering factors such as the existing grid and accessibility. 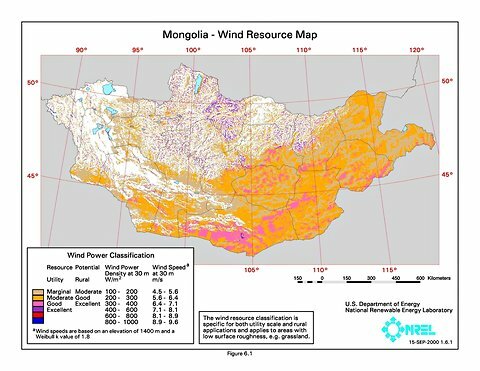 If additional areas with moderate wind resource potential (or good for rural-power applications) are considered, the estimated total windy land area increases to more than 620,000 km2, or almost 40% of the total land area of Mongolia. This amount of windy land could support over 4,300,000 MW of installed capacity and potentially deliver over 8 trillion kWh per year. There are 15 aimags with at least 50,000 MW, 12 aimags with at least 100,000 MW, and 9 aimags with at least 200,000 MW of wind potential.